When a child under the age of ten is asked to draw a house, it is typically a Georgian house, with a door in the middle and sash windows to the side. Everyone loves Georgian architecture. 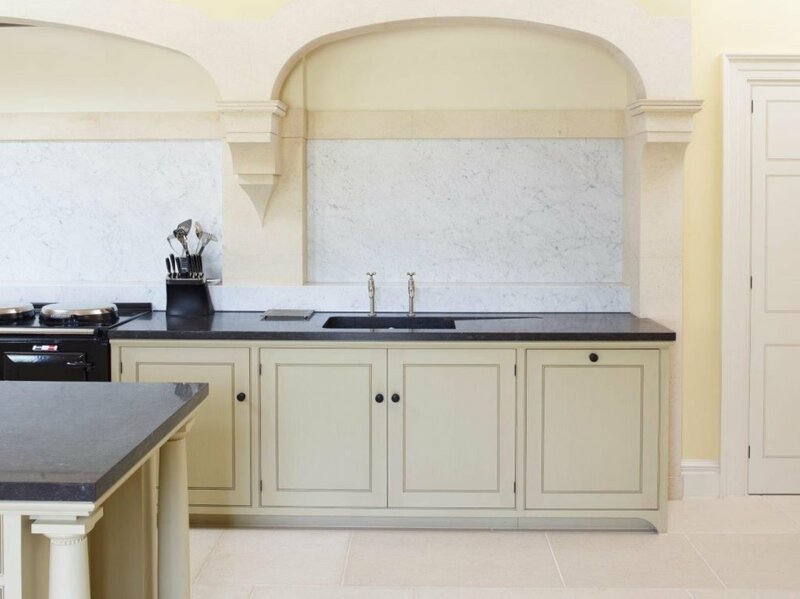 There is something about its proportions, its materials and its grandeur that makes it appealing to all of us, and the same applies to elegant Georgian kitchen design. Georgian kitchen design as we think of it today is a little misleading. In the 1700s, most kitchens on the great houses of Britain were often positioned in a wing or subsidiary building. This was to keep cooking and curing smells away from the main house. Original Georgian kitchens were in fact quite devoid of furniture and any sense of intentional interior design. Their focus was more on the appliances such as cooking grates, spits and ovens. There may have been a cook’s table and a dresser to store pots in, but that was as flamboyant as most got. 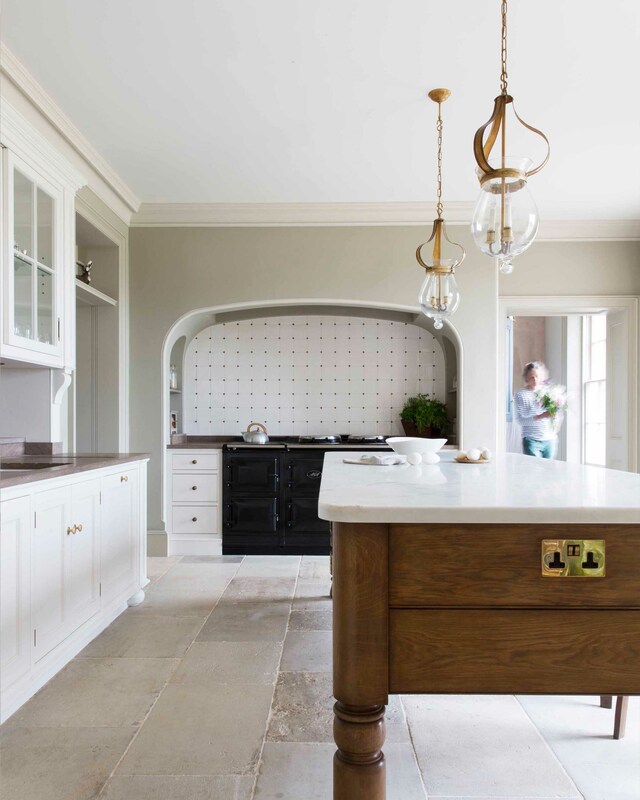 Artichoke created this Georgian kitchen design for a Dorset country house built originally in the early 1700s. Artichoke designed the mouldings on the stone over mantle to match the scale of the room. .
Owners of grand houses did not like to spend money on their back of house spaces and consequently most original Georgian kitchen designs were kept pared back and understated. As the industrial revolution began to take hold, a burgeoning middle class began to appear and servants left their roles serving the upper and middle classes to take jobs in factories. Servant’s wages began to rise to a point where hiring them became unsustainable for country estates, and as a consequence, the lady of the house became more involved in the kitchen. This marked the turning point in kitchen design. Home owners did not want to spend their day in the dingy spaces that their predecessors’ staff had had to endure, and as a result, back of house kitchens manned by maids were userped by front of house kitchens manned by their owners. And with the Georgian kitchen’s new prominent location within the home came a sharper focus on interiors and kitchen furniture design. 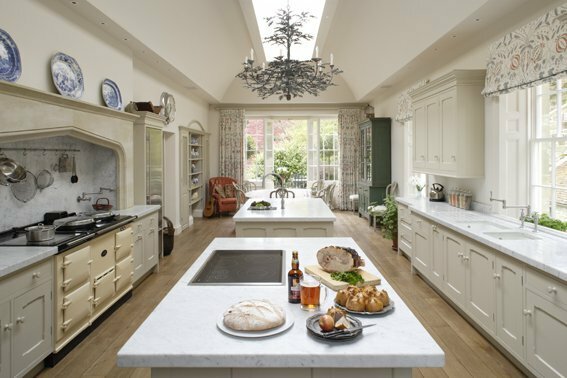 This Artichoke designed kitchen used the Georgian cook’s kitchen as its centrepiece. Simple glazed storage for glassware. When kitchens were back of house, their detail was kept to a minimum for a number of reasons. Detail costs money, and detail takes time to clean. The door frames were therefore typically square and the cabinets were usually devoid of mouldings and decoration. When kitchens were moved to the ground floor of the main house, the rooms were larger, as were the budgets. The scale and proportion of these larger spaces also allowed for greater decoration and moulding to match the spaces they were in. 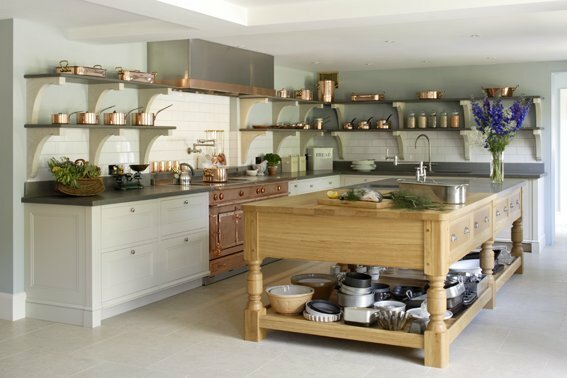 Typical kitchen tasks, previously divided in separate smaller basement rooms such as scullery, pantry, larder and cooking were now amalgamated into a single larger space. The Georgian kitchen had become and multi functional space. 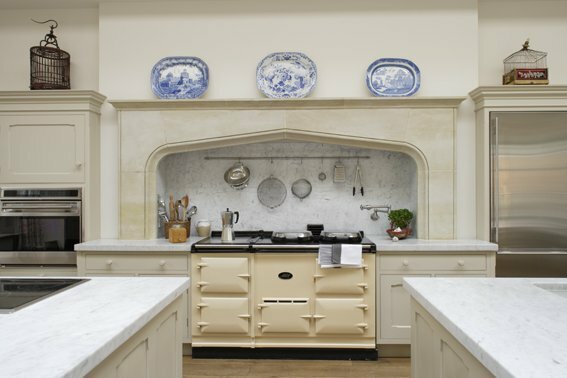 This grand Georgian kitchen was designed by the architect Craig Hamilton and made by Artichoke. It illustrates how a larger room can take more detail. 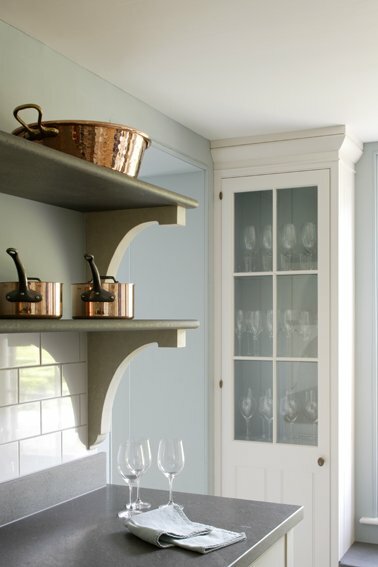 Greek classical mouldings were used in the design of this kitchen. The columns on the kitchen island reflect detail elsewhere on the façade of the Georgian building. 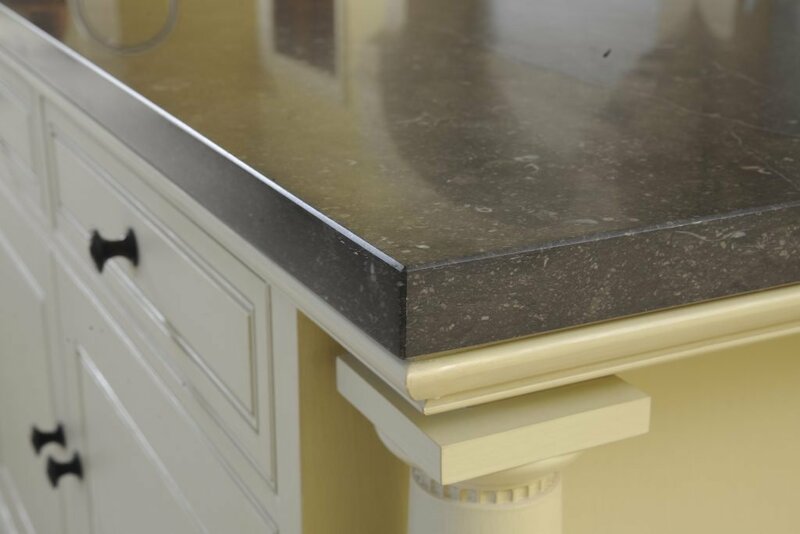 What Stone and Marble for Luxury Bespoke Kitchens?